Yes, it’s all locally made in Amish Country. Featuring baked goods, jams, jellies, pickled vegetables, really good coffee, snacks, cheese, jerky, fudge and honey all from Lancaster County. We also have an oil and vinegar bar. 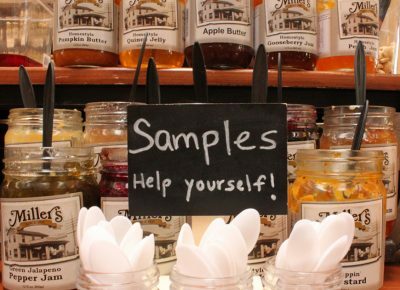 Come sample oils, vinegars, jams, jellies and mustards for free! 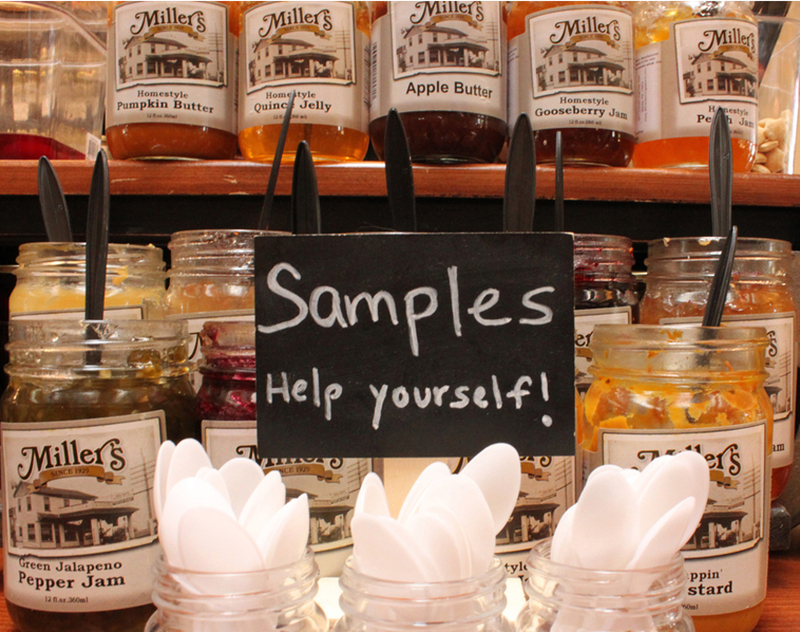 We have daily samplings of over 50 items! Shop our fresh baked pies, breads and sweet treats that are baked daily at Miller’s Bakery. We use traditional recipes and fresh ingredients to provide you with the tastiest baked goods in Lancaster County. SHIP-A-SHOOFLY: Send something deliciously different! If a singing telegram isn’t quite right and flowers seem ordinary, then have we got an idea for you! Next time, send one of Anna Miller’s wet-bottom shoo-fly pies or chocolate pecan pies. They’re unforgettable because you can include a decorative tin and personalized note, making great gifts for any holiday or special occasion. To “ship-a-shoofly” or chocolate pecan pie, call us toll-free at 800-669-3568 or visit http://www.locallymadefoodshop.com for more information.